The Harbourview Sculpture Trail (2014) Te Atatu Peninsula is a biennial exhibition of contemporary art, first held in March 2012, which features 52 sculptures by established and emerging New Zealand artists. The exhibition challenges artists to develop site specific artworks that are inspired by the local history, natural environment and social and political issues of this area. The site has as its focal point the large horseshoe shaped Danica Pond on Te Atatu Peninsula, in the middle of a sensitive coastal salt marsh environment with beautiful views down the Waitemata Harbour to Auckland City, the Harbour Bridge and Rangitoto Island beyond. Two different themes have become apparent in the works that were selected, the first relates to a very close relationship and observation of the natural flora and fauna of the delicate salt marsh environment with works capturing this in many varied mediums with many works being created specifically for the site. glass, Perspex, water, steel and movement. 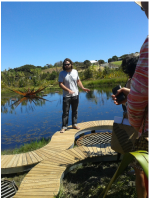 It is my hope that the essence of the sculptures connects with your spirit and soul as you experience the Harbourview Sculpture Trail and you leave feeling uplifted and inspired. This event has been organised by the team at Peninsula Arts Inc.
Nicky Adams, Diane Atkinson, Karin Barr, Katherine Batchelor, Russell Beck, Billadonna, Phil Bonham, Jonathan Bowman, Audrey Boyle, Trish Clarke, Matthew Cowan, Tim Elliot, Expressive Art Group, Dawn J Flower, Ross Forbes, Anton Forde, Kathrine Fraser, Bev Goodwin, Carol Green, Mia Hamilton, Cathy Head, Dermot Kelly, Doug Kennedy, Phillippa Kenny, Juliette Laird, Jay Lloyd, Laura Marsh, Aaron McConchie, Jenny McLeod, Alysn Midgelow-Marsden, Sharonagh Montrose, Justin Murfitt, Zoe Nash, Trevor Nathan, Ainsley O’Connell, Simon Payton, John Pryor, John Rawson, Fiona Rennie Schwieters, Ramon Robertson, Carol Robinson, Rebecca Rose, Donna Sarten, Mark Schafer, A.D Schierning, Kerry-Ann Stanton, Faith Tavernor, Jeff Thomson, Stuart Thomson, Natalie Tozer, Clovis Viscoe & Bruce Young. 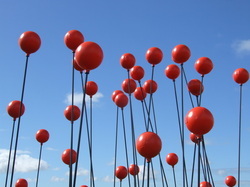 Harbourview Sculpture Trail (2012), Te Atatu Peninsula. Curator and one of the organising group ( of 4) for this project. This exciting exhibition of 45 sculptures by contemporary New Zealand artists will be displayed for 4 weeks in March along a trail through a unique salt marsh area with ponds and stunning views across the Waitemata Harbour to Auckland City, the Harbour Bridge and Rangitoto Island beyond. This art event has been set up by Te Atatu Business Association with support from Auckland Council to, enhance the environment of Te Atatu Peninsula and as a fundraising opportunity for Hospice West Auckland, whose purpose is to ensure all New Zealanders have access to the best possible hospice care at the end of their lives. The 45 artworks in this exhibition, from 35 contemporary New Zealand artists have been chosen for their connection to the rich local history and the natural uniqueness of this salt marsh area that surrounds the Te Atatu Peninsula that was once kauri forest and peat swamps. Several artworks also comment on social and political issues that affect communities and environments in this area, greater Auckland and globally. Artworks are all for sale. Proceeds to Hospice West Auckland. 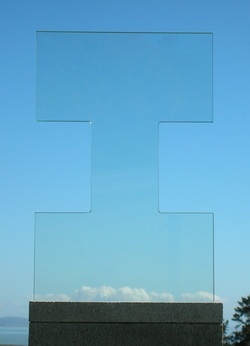 From 2008 to present I have been curator of Kaipara Coast Sculpture Gardens located at Kaukapakapa, north of Auckland. I was responsible for project managing with the owner, David Bayly the creation of a unique1km sculpture trail set in a tranquil rural oasis featuring the work of 40 emerging and mid career New Zealand artists set on previously undeveloped rural farmland. Annually I curate the thought provoking, yet accessible exhibitions of approximately 60 sculptures, which open in November each year. Exhibition 2010 was opened by Prime Minister John Key on 6 November 2009 with 250 guests enjoying a lovely evening. From 1999 to 2007 I was a director and owner of Art Of This World, a contemporary, retail art gallery selling artwork, original paintings, pottery, ceramics, glass, prints and framing solutions all created by established and emerging New Zealand artists in a large open attractive gallery space located in Devonport, Auckland. The businesses aim was to make New Zealand art affordable and approachable to the general New Zealand public. The exhibition programme featured 8 exhibitions each year. From1993 to 1999 I was a director and owner of Art by the Sea, a contemporary retail art gallery, in Devonport, Auckland set up to make New Zealand art affordable and approachable to the general New Zealand public.